Great for indoor and outdoor environments, recycled plastic is impervious to the elements and maintenance free. The 8 individual 2" x 4" reinforced recycled plastic planks make up the contoured bench seat and back construction. The large, modern rounded MIG welded steel frame is constructed with 10-gauge, 2-3/8" O.D. steel tubing and reinforcement bars to ensure top structural strength and support. 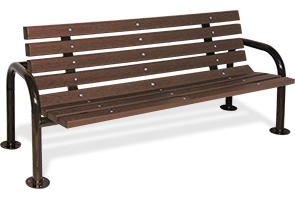 A powder-coated finish protects the frame from rust, corrosion, fading or chipping, allowing this innovative 6' and 8' contour bench to be great in high traffic areas. Zinc plated hardware included and portable, surface and in-ground mounting configured models are available.